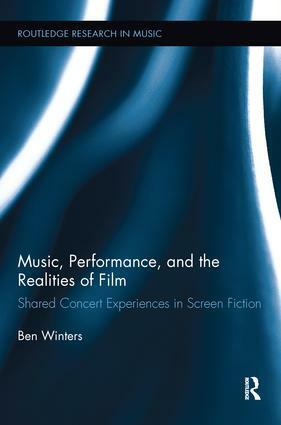 This book examines the relationship between narrative film and reality, as seen through the lens of on-screen classical concert performance. By investigating these scenes, wherein the performance of music is foregrounded in the narrative, Winters uncovers how concert performance reflexively articulates music's importance to the ontology of film. The book asserts that narrative film of a variety of aesthetic approaches and traditions is no mere copy of everyday reality, but constitutes its own filmic reality, and that the music heard in a film's underscore plays an important role in distinguishing film reality from the everyday. As a result, concert scenes are examined as sites for provocative interactions between these two realities, in which real-world musicians appear in fictional narratives, and an audience’s suspension of disbelief is problematised. In blurring the musical experiences of onscreen observers and participants, these concert scenes also allegorize music’s role in creating a shared subjectivity between film audience and character, and prompt Winters to propose a radically new vision of music’s role in narrative cinema wherein musical underscore becomes part of a shared audio-visual space that may be just as accessible to the characters as the music they encounter in scenes of concert performance. Fantasizing, Visualizing, Miming: ‘Fictional’ Listening?